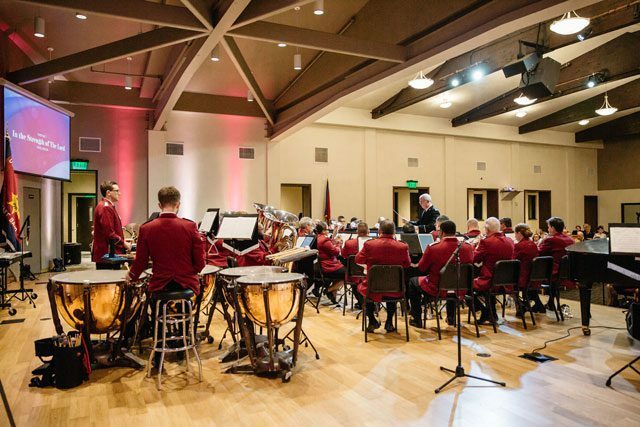 Staff Band honors Ivor Bosanko and his music in a concert at the Torrance Corps. 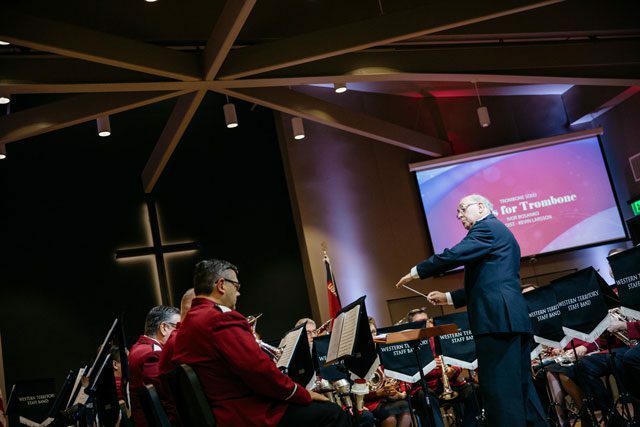 The Salvation Army Western Territory Staff Band (WTSB), led by Bandmaster Neil Smith, presented “A Festival of Praise,” featuring the music of Ivor Bosanko, Oct. 20 at the Torrance (California) Corps. Bosanko conducted many of the pieces and his wife, Janette, led the Western Music Institute (WMI) Alumni Chorale, adding a vocal component to the evening’s entertainment. Commissioners Kenneth G. and Jolene K. Hodder participated, with Kenneth Hodder serving as master of ceremonies, offering historical notes about the pieces; he also brought the devotional message. 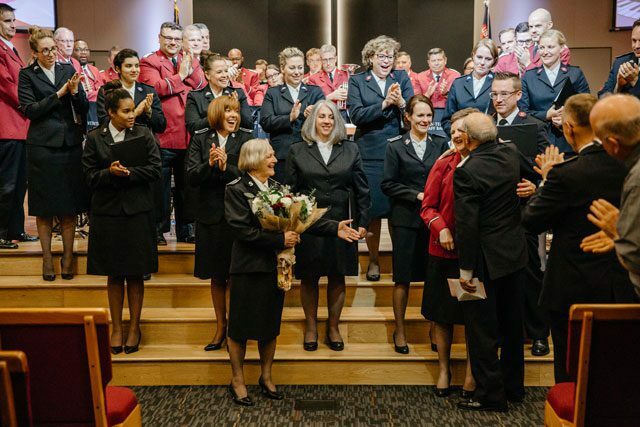 The Torrance Corps was an appropriate venue for the concert, as the Bosankos served in music ministry there for many years. WTSB member Garry Lawrence shares memories with the Bosankos from even longer ago—back to their roots in Cardiff, Wales. 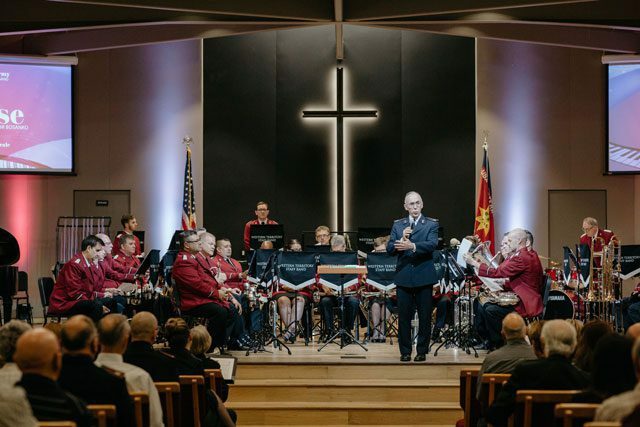 After the band’s opening number, “Rocky Mountain Centennial,” Major Darren Norton, WTSB Executive Officer, welcomed the audience and prayed. 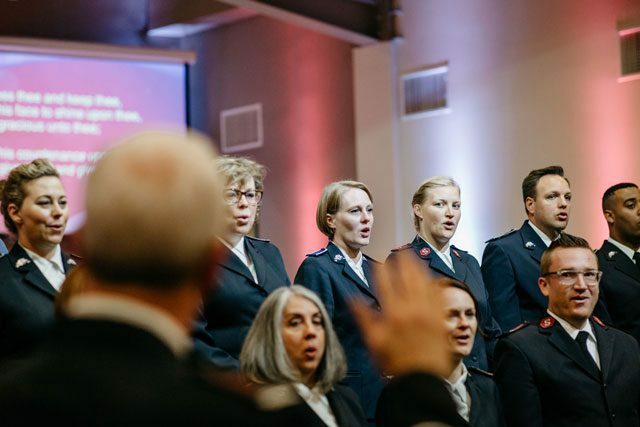 The next selection, “In the Strength of The Lord,” written by Kevin Larsson, featured the melodies of Bosanko. The WMI Chorale then presented two songs by Bosanko, “We Shall Win” and “Yesterday, Today, Forever,” which featured Lawrence on flugelhorn. The next selection, Bosanko’s “Songs for Trombone,” highlighted Larsson as soloist. 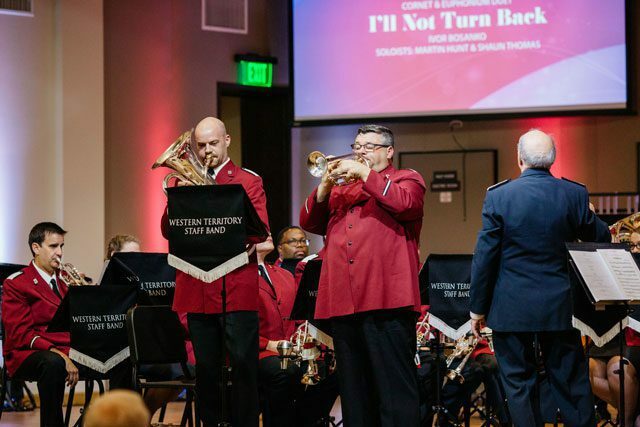 Together the WTSB and the WMI Alumni Chorale performed “Reflections,” followed by “This is My Song,” with Barbara Allen as vocalist, Bosanko on piano, John Docter on trumpet and Larsson on trombone. 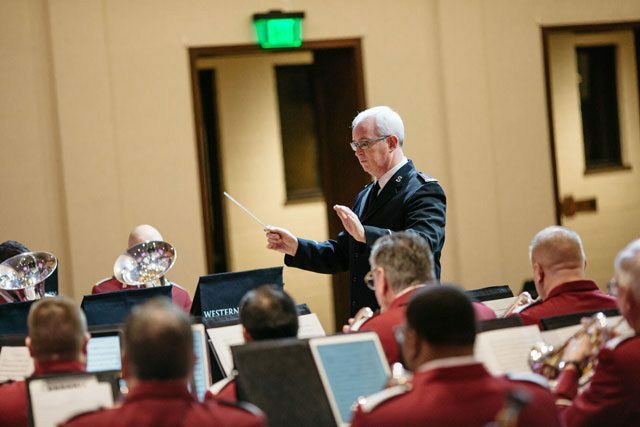 After the Staff Band offered “Majesty” (Samuel Shelley), Martin Hunt (cornet) and Shaun Thomas (euphonium) performed Bosanko’s “I’ll Not Turn Back.” Hodder noted that this song has special significance for him and his wife, as it played a part in their commissioning weekend 30 years ago. The chorale sang Bosanko’s “A Robe of White” and “His Provision,” followed by the band, which performed “To Boldly Go,” by Peter Graham. In his devotional message, Hodder told the story of the “Symphony for a Broken Orchestra,” (David Lang), when a group of musicians—all with broken instruments—assembled to make music despite their limitations. And they succeeded. 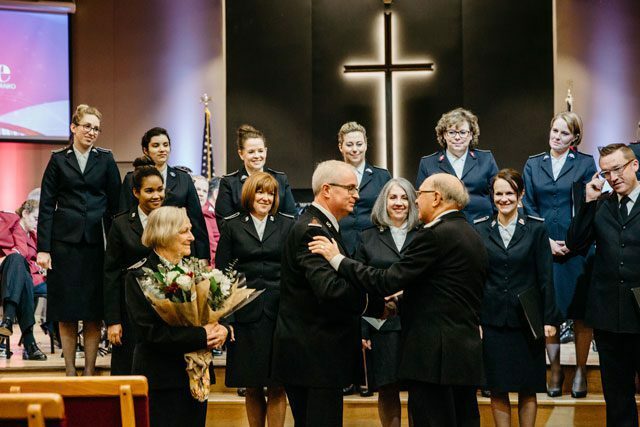 Together the WTSB and the WMI Alumni Chorale offered two final pieces, “Marching to Zion” and “The Day of Victory (from Strathallan Suite). Commissioner Jolene K. Hodder closed the evening in prayer. Bosanko was born in Cardiff in 1936, and attended the Royal Welsh College of Music and Drama. Eventually he became Bandmaster of the Cardiff Canton Band. In 1975, Bosanko accepted the invitation to become Divisional Music Director of the Pendel Division in the USA Eastern Territory, where he and his family spent four years. They moved to the Western Territory in 1979, when Bosanko became the Territorial Music Secretary, serving in this position until retirement in 2001. 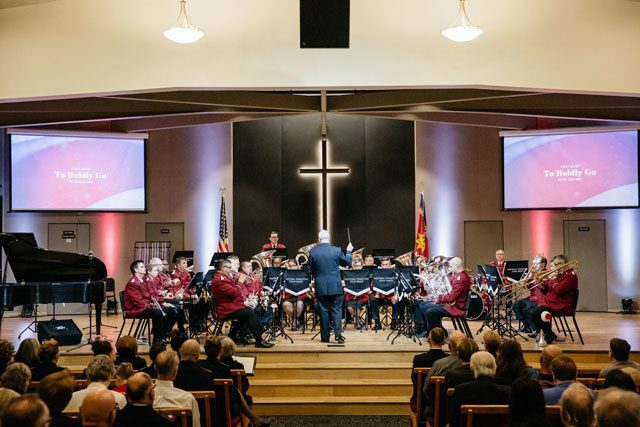 To view a portion of the concert, visit the Torrance Corps Facebook page.